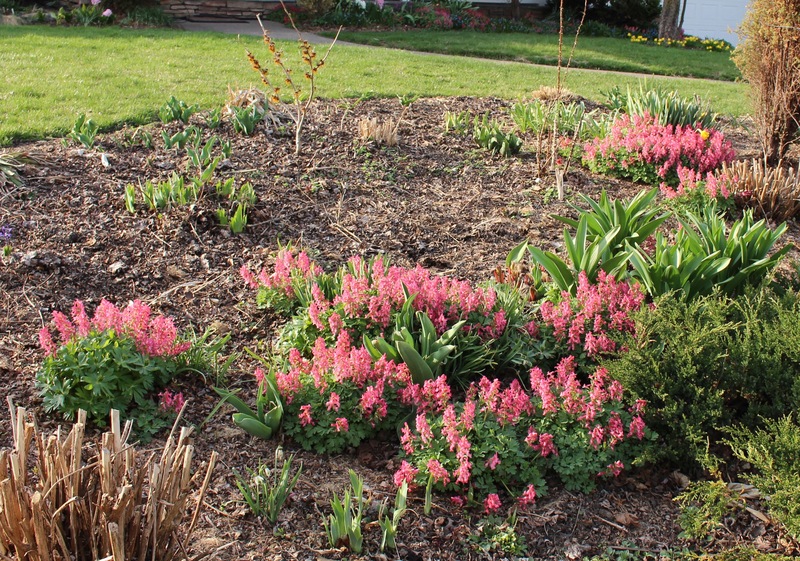 This entry was posted in early spring, front border, spring bulbs, Uncategorized and tagged corydalis, gardening in pennsylvania, spring, spring bulbs. I love the Beth Evans you sent. They’re larger than George Baker and noticeably brighter. I haven’t had spreading from George B. or the other successful Purple Bird. Maybe Beth will be a more prolific seeder? Being a distracted gardener I may notice them going to seed, win the midst of doing something else, stop and promptly dig and transplant a few, and water in. Quick and easy. I will be more brave about moving them. Of course I missed sorting them out this year already! I hope my Corydalis solida spread like yours! I have had a few seedlings from the purple coloured C. solida but none from Beth Evans, I’m hoping for lots more. So glad spring has arrived with you at ;last. I hope you see seedlings soon as well. I’m always amazed at where they come up, I wouldn’t think to plant them there yet there they are! I looked out the window this morning and saw my first fritillaria m. open. Two weeks ago we had snow, now this garden has practically caught up to yours! Amazing how quickly things go once started, I just hope we get some more time to enjoy the tulips! Happy Spring! Just planted my first corydalis (flexuosa) and am eager to see how they do. Yours look great and the abundance wouldn’t bother me one bit. Lucky you! I’ve admired flexuosa many a time, but word is they don’t like the summers here on the East coast. I think it far prefers your corner of the map. Hope it does well! Wow, I can’t believe how quickly your garden goes from dead of winter to full throttle spring. I love Corydalis and make no effort to keep the colours separate, I just love how you get carpets of shades running from red to pink to lilac to purple. Your Beth Evans clumps are very impressive. Funnily enough George Baker never does very well for me, I suppose it is just too promiscuous. 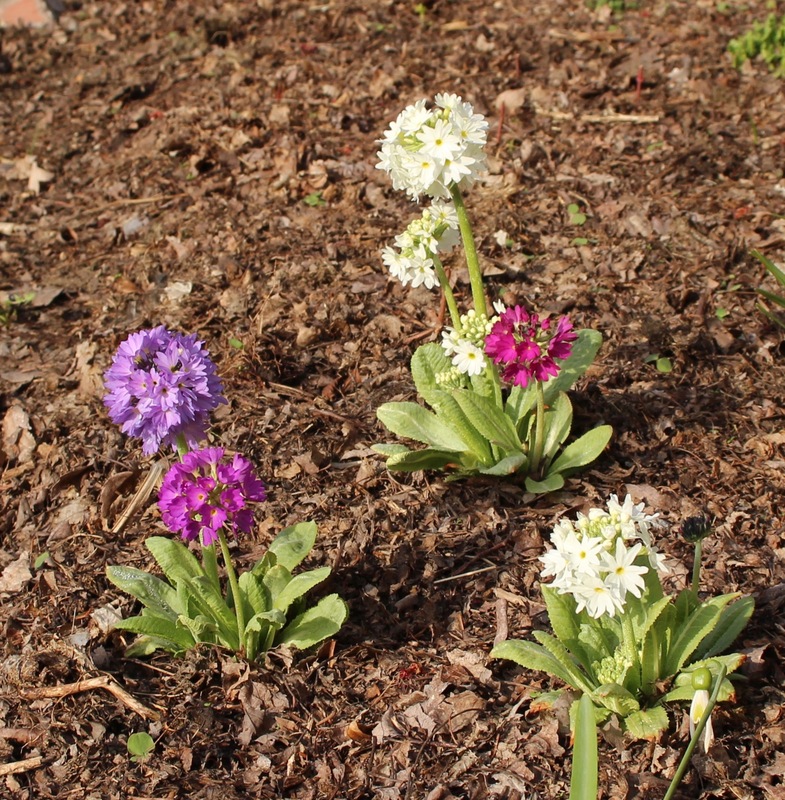 And Primula denticulata in bloom as the same time as mine? When only yesterday you still had snow. I expect it will be roses tomorrow and day lilies on Thursday. Yes, it’s a bit unnerving to see my favorite part of the year barreling by so quickly. 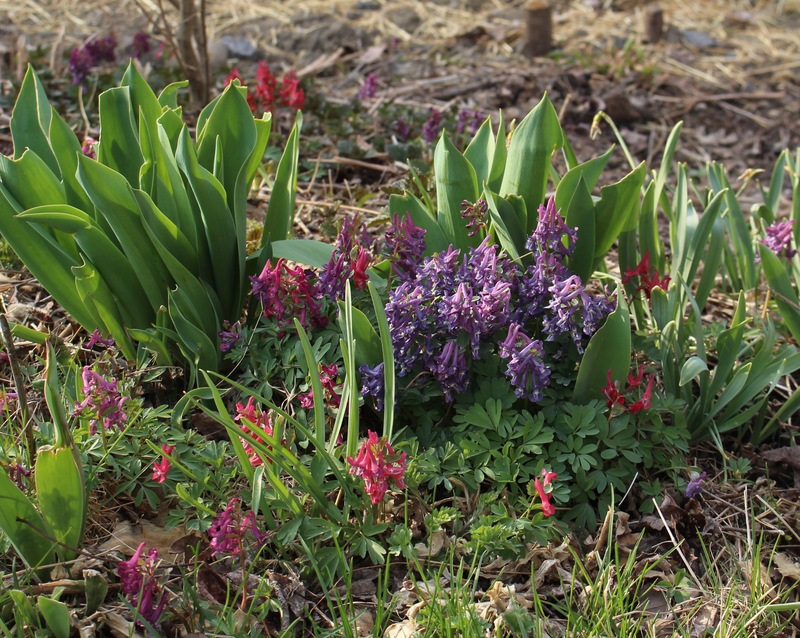 Here it is six days later and the corydalis are completely finished while the first tulips are opening. Working in the garden yesterday I could see sunflower seedlings becoming noticeably larger as morning passed into the afternoon, and of course they’ve all come up in the wrong spot. Hopefully cooler temperatures will slow it down enough to enjoy. My George Baker does well enough but I’m fairly sure it’s not the real thing. Unless they grow right next to each other I can barely see a difference between him and Beth. Come to think of it Beth may also be an imposter but like you say, it’s barely worth the time to keep the colors separate. Happiness is a garden full of spring ephemerals. Your Corydalis is gorgeous. I have only the native yellow one. It seeds itself all around the garden beds. I just love it. I a surprised that your primroses are so beautiful. They look quite happy where you have them. 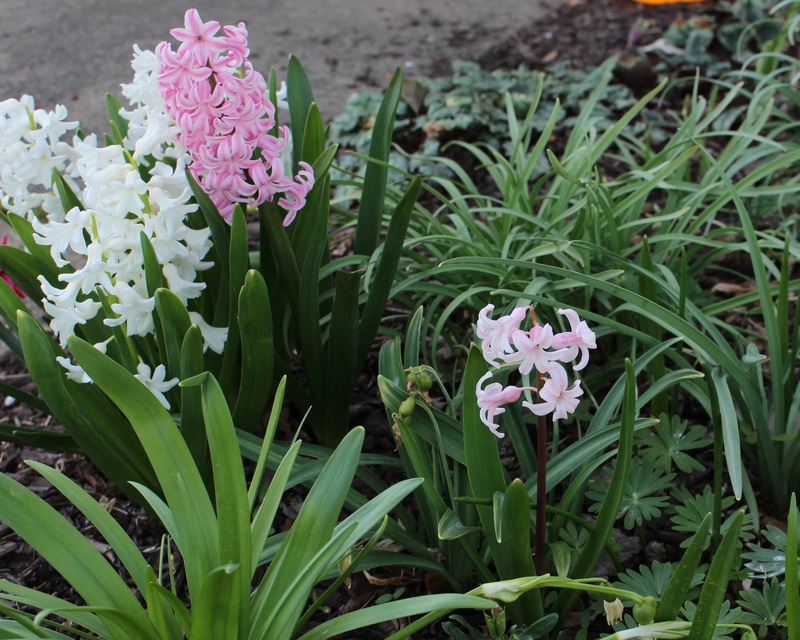 Enjoy this spring weather and blooms. I was driving along a section of road that I don’t get to most springs, and was thrilled to see a corydalis look-alike, squirrel corn (Dicentra canadensis). I actually thought it was a corydalis until I got home and looked it up. Of course now I need to keep my eyes open for a chance to add these to my garden… and the yellow one as well! Plus you can’t beat all that color which comes up on the second warm day of spring! Hooray for spring! I have corydalis coming up but none has bloomed yet. I do have some daffodils blooming, though. The very earliest ones. Haha, and here I am five days later with all the corydalis over and the daffs all opening. Scary how fast a late spring can catch up! 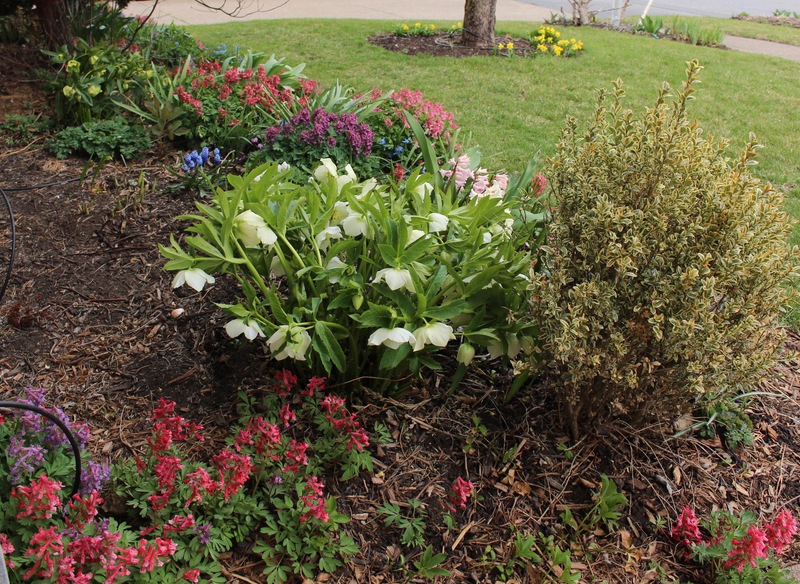 It looks so gorgeous and spring-like in your garden. Warmer temps and rain predicted for much of this week here. Hope tonight’s overnight low of 28 degrees is the last of winter. Yuck. We have a forecast full of rain as well, but no frost predicted for the next 10 days. Actually it’s looking downright warm, and I hope that’s not a prelude to some kind of nasty late spring freeze. Love the corydalis. Laughing at the image of you harassing the snowdrops. haha, yes you would probably laugh even harder if you actually witnessed the poking and probing and shuffling around in a crouched position! It’s good to read that spring has arrived; I really don’t know how you survive such a long winter. But it does all catch up very quickly, the Corydalis are lovely, the perfect plant that flowers and then disappears! I have a lot of the yellow Corydallis. I’ve become a fan. I also like the white ones and would love to have some of the blue. Glad that spring is finally arrived in your neighborhood.